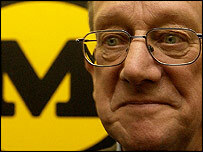 Former Asda boss Archie Norman has said he has no plans to join the board of struggling supermarket Morrisons. Mr Norman was responding to speculation that Morrisons deputy chairman David Jones wants to entice him to join. He told the Observer that he had not been approached by Morrisons and would not want a job there anyway. Mr Norman did, however, confirm the speculation of a boardroom spat between Morrisons' chairman Sir Ken Morrison and deputy chairman David Jones. "I have no intention of becoming involved in a dispute between two people [Sir Ken and Mr Jones] whom I like and respect," said Mr Norman. 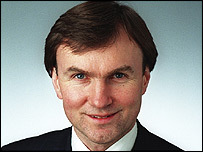 The former Conservative MP stood down from his seat in Tunbridge Wells at the last election. Rumours of a feud between Sir Ken and Mr Jones have grown at the same time as the company has issued no less than five profit warnings since buying Safeway in 2004. As Morrisons has struggled to merge the two companies, Sir Ken and Mr Jones are said to have clashed over the best way forward. Earlier this month the supermarket appointed three non-executive directors to its board, after pressure from investors for more accountability. Mr Jones was said to have shared the investors' call. The new non-executive directors are Brian Flanagan, who worked for Mars for 26 years, Susan Murray, a former chief executive of Littlewoods Stores, and Nigel Robertson, who helped establish Ocado - an internet-based grocery shopping operation in partnership with John Lewis' Waitrose. On 8 June Morrisons forecast annual profits of between £50m and £150m - well below expectations. Analysts had been expecting profits of between £225m and £275m.